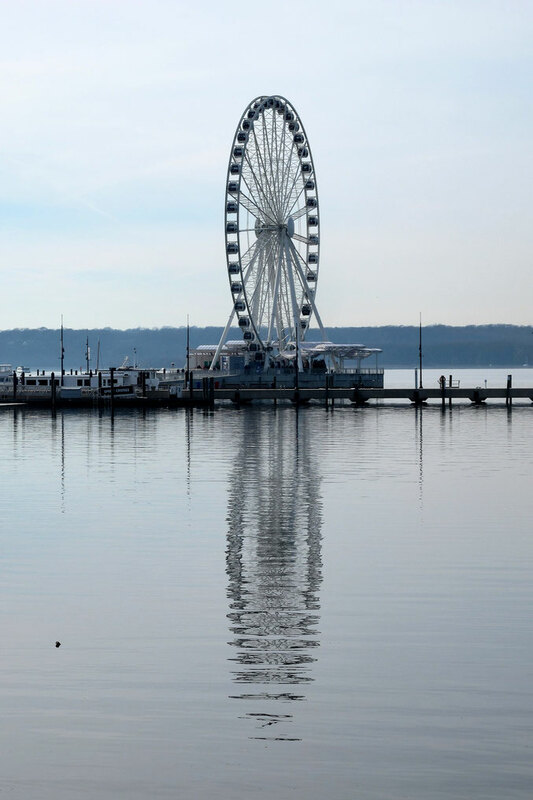 Today Calls for: "Overcast with a Slight Ripple"
The location was at the entrance to the National Harbor in Maryland. The "Take It!" came after driving on the grand view sweeping entrance to the "National Harbor" in Maryland. The sky was overcast but the water in the harbor next to smooth which it is a rare occurrence as it is an offshoot of the fast flowing Potomac River. This was one of those times when one wishes for perfection, such as having the sky be clear and bright blue, and the water be perfectly smooth to offer a flawless mirror image of the exciting Ferris wheel. What happened was a matter of taking what was offered and being ever so glad to have it. The After Take: This is one of those photos that I enjoy taking a moment before showing it to an individual to verbalize the title in advance. Everyone seems to enjoy this photo for its content and thankfully they all get either a laugh or a smile out of the title. I know I have shown photos of this wonder wheel in the past - but here I am again - seemingly not able to get enough of it. When you next visit our area, please think of including a visit to this gently rotating attraction. It will not disappoint. The quest for perfection can ever so often be set aside with gratitude for the presentation of the gift of things as they are. I have come to find, there are times when imperfection is stunning in its beauty. There are other times when there is no imperfection - it sort of is akin to "Each Day is a Gift." I remember the other picture that was the framework for this Ferris wheel! This thing looks huge. Our kids would go nuts for this thing. It looks like it has a stunning view. Honestly I think the ripple looks great with the over cast. I can picture it sunny in my minds eye and I think this may be a better presentation. I have been to National Harbor quite a few times when traveling with our students for the big DC trip they do every year. This will be a must see this upcoming Spring. I wonder how far one can see atop that. It looks like it must be a spectacular site. Taylor told me he was afraid to go on this thing. It doesn't look nearly as intimidating as he portrayed it.